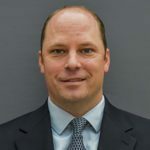 He recently moved to Connecticut from Tulsa, Oklahoma where he practiced sports medicine for nine years with Advanced Orthopedics of Oklahoma. In Tulsa, he was the team physician for Bixby High School and consulted for Oklahoma Wesleyan University. Also, he was a Clinical Preceptor for OSU medical students and resident. Prior to Oklahoma, he did his sports medicine training at Resurrection Medical Center in Chicago, Illinois where he was a team physician for the Chicago Storm, North Park University, Lane Tech Prep High School, and Whitney Young Prep High School. Also, he provided physician coverage for the 2008 Chicago Marathon by working at the 20 mile aid station. His passion for sports medicine began when he was a three sport athlete in high school and played a year of college football at Kansas State University. During his family medicine residency in Colorado, he pursued a career in primary care sports medicine by working at the base of Crested Butte Ski Resort and covering the Leadville 100 Bike race which exposed him to multiple sports injuries and high altitude illness. His broad training and experience has taught him to use a holistic approach with each patient to not only focus on the injury, but also look at what could have caused the problem. Therefore, he individualizes each treatment plan to get the patient back to where they need to be and to prevent the same injury from re-occurring. His special interests are ultrasound guided procedures and sports related concussion management. When he is not spending time with my family, he enjoys mountain biking, hiking, skiing, playing golf, fishing and attending different sports venues.